Workhorse Harness The Workhorse is an all-in-one harness that can be used with any attachment to train every game time movement we make. From shuffles, bounds, sprints, drops, backpedals, swings, throws, and kicks, the Workhorse is capable of putting resistance or over-speed in every movement without altering the natural mechanics of those movements. Each Workhorse is hand-sewn from heavy-duty materials to ensure incredible quality and durability. 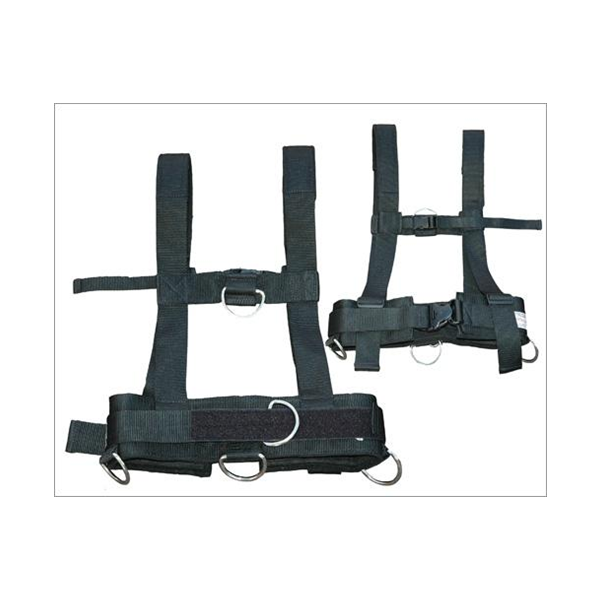 With the Workhorse we eliminate the need for multiple harnesses and belts. Now every athlete can have his or her own custom fit harness. The Workhorse was designed with simplicity in mind. Athletes can very quickly move from station to station, drill to drill, in large numbers or small, without fumbling to get equipment on and ready. Simply step up, attach desired equipment for predetermined drill, and go. Once strapped into the Workhorse athletes have the options to hook up to many different steel rings that are sewn into the harness located at: Left Hip-Right Hip-Lower Back-Center of Back-Left Shoulder Blade - Right Shoulder Blade - Left Peck - Right Peck In addition to those 8 solid attachment points the Workhorse also has 2 “Saturn Rings” which rotate nearly 360 degrees around the athletes waist. The Saturn Rings let us anchor from 2 different points while working drills that require multiple changes of direction. The Workhorse can be attached to any Resistance Cords, Quick Release Leash, Sleds, Leashes, and other attachments via a 2.2m(7ft) leash Workhorse comes complete with: -Hand-sewn, heavy-duty construction -8 sewn in rings to be used for attachment points -2 Saturn Rings that rotate nearly 360 degrees around waist -Padded Shoulder straps -Padded Waist belt -Adjustable Waist buckle -Adjustable Shoulder straps -Adjustable Chest Buckle -2.2m (7ft) leash.